The philosophy of customer success is, at heart, a return to giving the people what they want – even when what they want lies outside of the product, or even outside the scope of the company. What is the success gap? Think of it this way. When you buy shoes, are you successful when you go into a shoe store, try on a pair of hiking boots, and purchase them? Or are you successful on mile 5 of your hike when your feet aren’t sore or blistered? Customer success says you’re only successful when the shoe fits, not in the store, but on the trail. Notice that it’s the customer’s desired outcome that is the key – not what you think represents the customer’s successful use of your product. Does your product get your customers where they need to go? If you can bridge the success gap for your customers and become instrumental in helping them achieve their real-world goals – oh honey. Huge opportunities await you. Opportunities in marketing and retention, opportunities in up-selling and cross-selling, and most of all, opportunities to get a slice of the word-of-mouth pie. Your cost to acquire a new customer plummets, while your brand recognition increases. You discover that “negative churn” is not an urban legend as retention rates rise. That gap between what your product does and what your customer needs is the place where your churning customers trip and fall. Build a bridge, and reap the rewards. For SaaS products in particular, there’s often an educational component to closing the success gap. Take HubSpot’s website platform, for example. It’s an incredibly powerful product that brings together inbound marketing tools, content creation & social media tools and ecommerce platforms into one website that does it all – relatively intuitively. But while the product itself is fairly easy to use, you won’t get the very best results unless you know what you’re doing marketing-wise. To achieve the kind of business stardom you want, what you really need is a crash course in inbound marketing, and a solid understanding of how to use the website platform. So, even though they are not a teaching company like Lynda.com, HubSpot created the Inbound Certification, the HubSpot Certification and the HubSpot Design Certification – everything you need to build a successful online presence for your business with their product. Each user becomes a HubSpot evangelist, possibly bringing more businesses into the fold, but maybe just telling their friends about HubSpot’s free certification program. All of a sudden, HubSpot becomes a thought-leader in inbound marketing thanks to a hard-earned reputation for truly excellent, informative content. None of this would have happened if HubSpot weren’t truly concerned with making their customers successful in the real world. Need more inspiration? 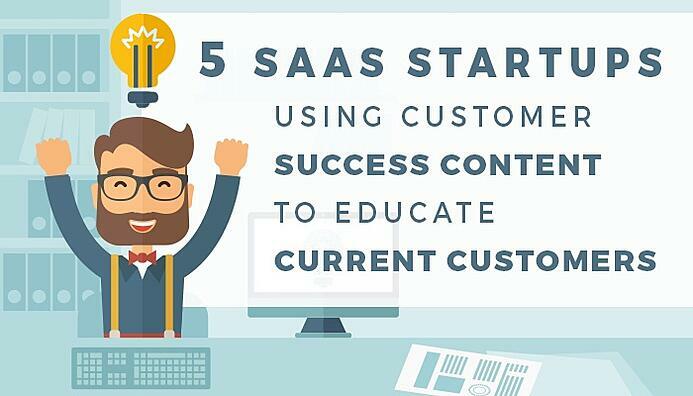 Here are 5 more SaaS Startups using customer success content to educate their customers. Vero is an email automation product that uses behavior tracking to send the right people the right emails at the right times – and their content is all about making your email marketing content better. Take their case study of Airbnb’s behavioral emails for example – not only does it highlight how Airbnb works its email magic, it comes with a tutorial to show you exactly how to send a personalized retention email using Vero. The lesson: Stack your customer success content with a case study, tutorial, and supporting blog posts so users know what to do and how to do it. Intercom is a messaging app that lets you chat with visitors on your website, send email and in-app messages for onboarding and retainment, request customer feedback in-app or via email, and of course, give customer support via mobile, website, or email. Essentially, any time you want to reach your customer, or they want to reach you, Intercom is there. One time you really want to reach your customer is when you’re a product manager deciding on what feature to improve or build. Intercom on Product Management, one of their free eBooks, is all about how product managers can use customer development tactics to build something people really want. The lesson: Use your customer success content to show customers how to use your product in ways they may not have thought of. Think “Ikea hacks” for your business. For Buffer’s customers, simply posting social media content is not where their success lies. They need to post content that achieves a goal, whether that’s to engage their audiences or position themselves as authorities. Content that helps them make the most of their social media presence is exactly what they need to close the success gap. The lesson: Plan your content calendar around teaching your customers how to do what they need to do better. It’s that simple. If you need help building out your content, take a look at this content creation checklist. Unbounce’s product helps you design landing pages that drive conversions with tools like built-in A/B testing, dynamic text, and custom scripts for analytics programs. Their content, unsurprisingly, is all about how to do that – better. Notice the one-two punch on this blog post – two seconds after you click on the post, just long enough to read the title Finding Inspiration to Write Unbeatable Copy for Landing Pages, a pop-up appears for an even more helpful offering: An eBook promising to teach you how to design for conversion by Unbounce co-founder Oli Gardner. All you have to do is subscribe to the Unbounce blog and it’s free. The lesson: Use your customer success content to support each other. Use a blog post to lead to an eBook that asks for a subscription that puts readers on an email list for even more customer success content. Visage, a data visualization tool, is very clever with positioning their customer success content. They use it as guest posts and partnered offerings. Take this one for example: Data Visualization 101: How to Design Charts and Graphs. For this high-value offer, Visage partnered with HubSpot to help users tell better stories with beautiful data visualizations. The lesson: Look for partners to help spread the news of your great customer success content. As traditional marketing methods are falling behind, customer success marketing is rising in popularity. Its ability to attract new and retain current clients at the same time makes it one of the most powerful marketing methods out there. But what I love most about it is that it brings us back to the values that made us want to go into business in the first place: Giving the people what they want. What they really, really want.